Fibre Archeology is being explored by HomeFree, exploring the history of hand made items and the tools used to make them. We have a small section in the shop dedicated to this topic, it is quite fascinating when one is not only able to "rescue" a hand made item but to also find out its history and the opportunity for it's story to continue. In this similar vein, I like to provide a little history to the newly born patterns that I have been developing over the short while. 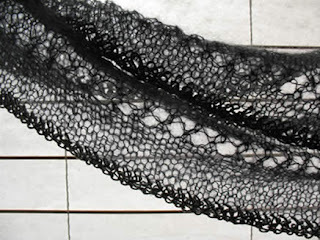 The newest pattern being a scarf that was inspired by a Habu mohair sweater (KIT 110). This sweater was my first introduction me to the beautiful and fascinating world of Habu, while Ryan and I were on a fibre reconnaissance trip to Vancouver. 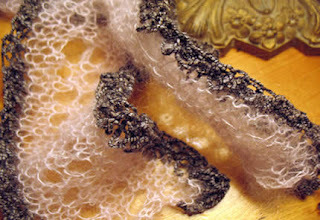 I loved the ultra fine mohair paired with a heavy and textured tsumugi silk, and while I loved it and have not finished the sweater yet, I wanted to capture the essence of it, and the idea of the scarf was born. These pictures were generously provided by artist Brenda Peteys who knit up the pattern before I got around to publishing it which worked beautifully as her two scarves are beautiful examples. I used the Habu Silk and Mohair while Brenda used Rowan Kidsilk Haze. Another free pattern that I would like to share :) I hope you enjoy it. I love this scarf - it makes me sooo wish that i could wear mohair, hmmmm I will have to look out for something that could work insted - any ideas??? ?